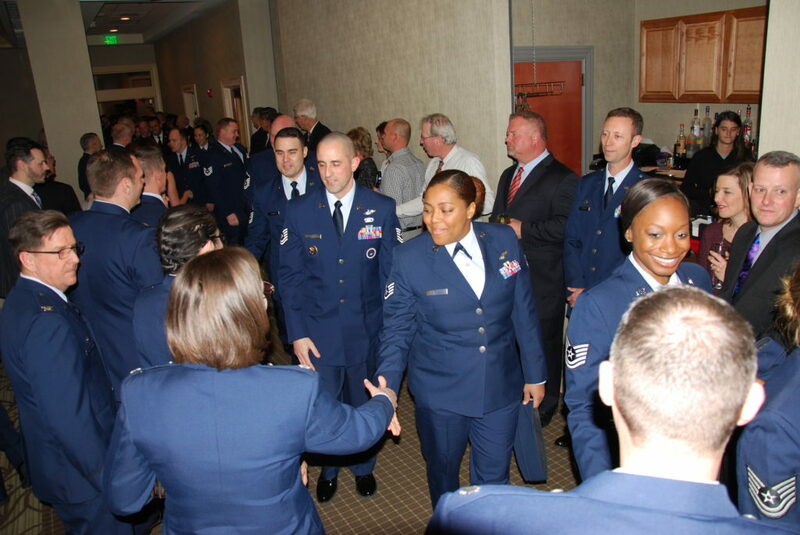 Attendees welcome enlisted airmen with a welcoming line. 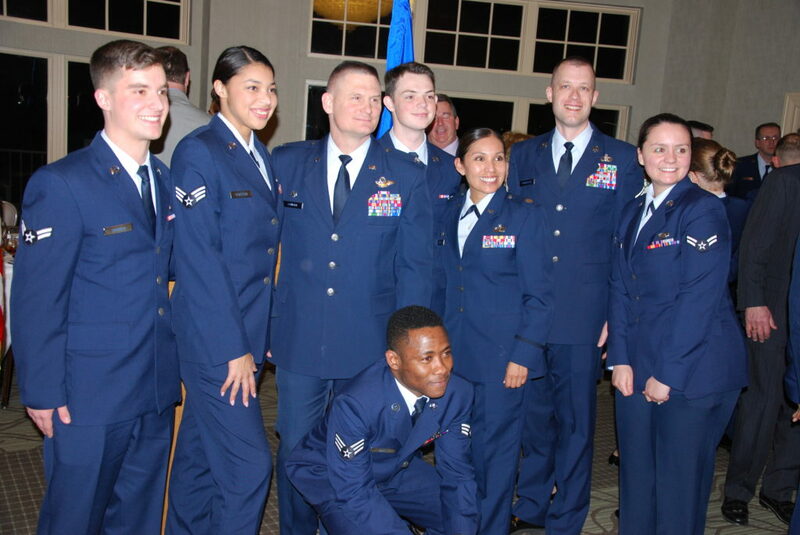 The Greater Belleville Chamber of Commerce Belle-Scott Committee hosted their 69th Annual Enlisted Dinner on Thursday, March 14th at the St. Clair Country Club to honor the enlisted men and women of Scott Air Force Base and thank them for their bravery, commitment, and sacrifice to our nation. This is an annual, sold-out event that reminds the community each year of the important role Scott Air Force Base plays in the metro-east. 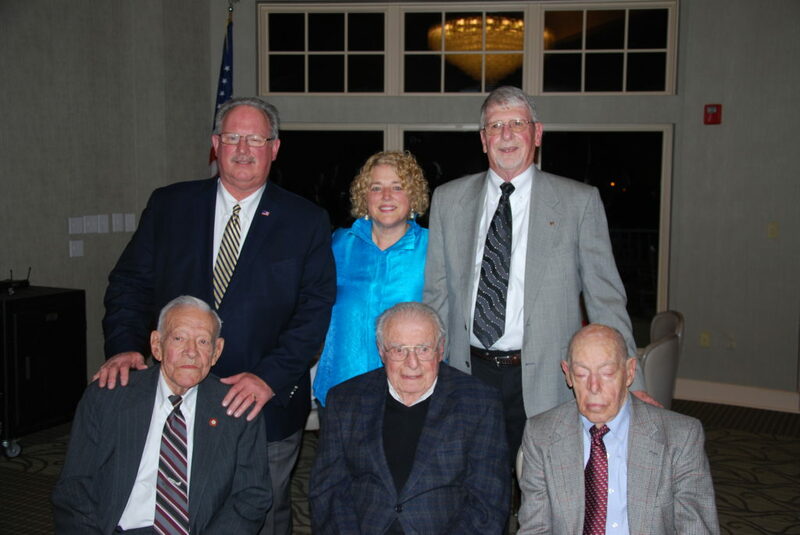 The Belle-Scott Committee, once known as “The Belleville Plan”, has been in existence since 1950 working to promote good relations between Belleville and Scott Air Force Base. The plan was announced at the First G.I. Pal Dinner (later known as the Belle-Scott Enlisted Dinner) which was held November 29, 1950, at the U.S.O. Canteen in Belleville. The dinner included remarks from Rick Vernier (St. Clair County), Mayor Mark Eckert (City of Belleville), and Col. Joseph Meyer (375th Air Mobility Wing). A special response was also given by SSgt. David Roberson, who was personally affected by Hurricane Michael that hit the Florida coast this past fall. He and his family were left with nothing but were welcomed with open arms at Scott Air Force Base after the tragedy. 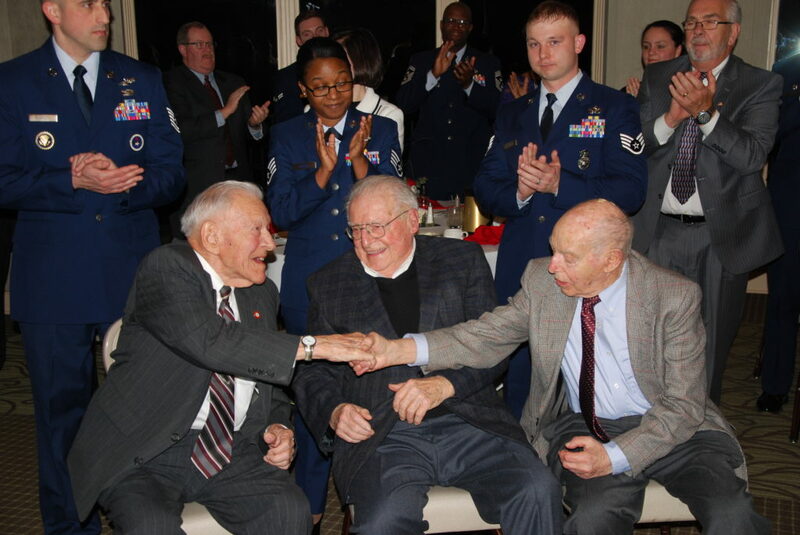 During the event, three U.S. Army Air Corps World War II veterans were also honored as special guests including Jim Reynolds (96, Swansea), Fred Bruss (94, Freeburg) and Ralph Goldsticker (97, St. Louis). Terry Foerste, a Belle-Scott committee member and Vietnam veteran, interviews veterans and composes biographies of the honorees that he then presents during the event. He was born in October 1921 and enlisted in U.S. Army Aviation Cadet Corps on July 6, 1942. He became a bombardier on a B-17. On June 6, 1944, during the D-Day invasion, Goldsticker’s aircraft flew two missions totaling 14 hours in the air. He was released from active service on October 20, 1945, after his 35th mission. Born in November 1922, Reynolds got into flying after a small plane landed on his father’s farm where he got a free ride and fell in love with flying at a young age. Reynolds ultimately became a pilot, and was qualified to fly 22 different aircraft. Reynolds flew numerous VIP missions, including for the vice president of the United States, secretary of the Army, secretary of the Air Force, director of the CIA, and retired Gen. Jimmy Doolittle. Overall, Reynolds ended his career with 9,700 military flight hours and 800 additional civilian hours. Before he retired from the Air Force in 1965, Reynolds was commander of the 375th Air Medical Squadron at Scott Air Force Base. Bruss was born in 1924 and is a Belleville native. At the age of 17, Bruss dropped out of high school the day after the Pearl Harbor attack to join the military service. Being too young, he was sent home but later drafted in 1942. Bruss was a gunner on an A-20 light attack bomber. Foerste explained that aircraft had one pilot and two gunners, and was used mostly for low altitude missions (200-300 ft above the ground). Bruss flew missions from April 1944 to January 1945. Bruss had to bail out once when his aircraft was damaged by anti-aircraft fire, and, on two more occasions, the aircraft sustained damage that required the aircraft to make a wheels-up belly crash landing behind Allied lines. Bruss was sent home March 25, 1945, after his 60th mission. Bruss later retired as the Belleville Fire Department’s fire chief. To find out more about this committee, contact the Greater Belleville Chamber of Commerce at 618-233-2015.